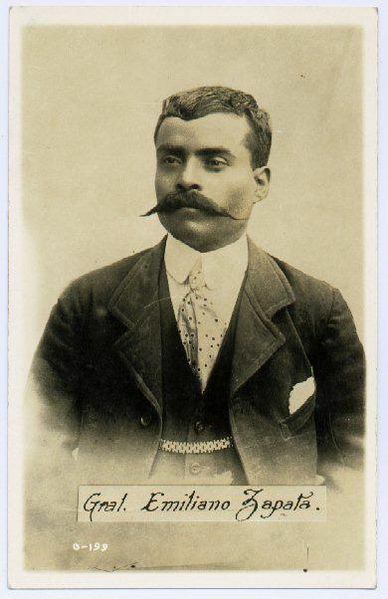 Of all the leaders in the Mexican Revolution, Emiliano Zapata was the most idealistic. He sought neither personal power nor wealth. His goal was to give "the lands, woods, and water that the landlords usurped" back to the peasants of his native state of Morelos. To the Indians of Morelos the land was more important than life itself. They spoke deeply of their patria chica (little fatherland), and the song they loved best ended with the refrain: "if they are going to kill me tomorrow, / why, let them kill me today." Emiliano Zapata hated the hacendados (big landlords) ever since he was a child. In 1910 he helped turn the landless peasants into a disciplined guerrilla army known as the Army in White. They wore the uniform attire of the Morelos farmer; white pants, white shirt and a sombrero. Shouting their slogan "Tierra y libertad" (land and liberty), the Zapatistas waged hit-and-run warfare on federal troops and seized the land from rich hacienda owners to give it to the peasants. Zapata never saw his dream of Agrarian land reform. Lured into a trap by federal troops in 1919, a year before the Mexican Revolution ended, he was cold-bloodedly assassinated when he was only 39 years old. On January 1, 1994, The EZLN (Ejercito Zapatista de Liberacion Nacional), led by the masked "Subcomandante Marcos," seized the town of San Cristobal de las Casas in Chiapas, Mexico. Their name taken from the heroic Mexican General Emiliano Zapata, for them Zapata embodied the most uncompromising ideal of the peasant revolt, that of demanding radical agrarian reform. It's no accident that today's Zapatistas invoke his name, for the redistribution of power and the state's resources from the wealthy few to the many poor. The "Zapatistas" as they became known around the world, were forced out of the town by the Mexican army. The Zapatistas fled the city to the Lacandon Jungle. Although a ceasefire was agreed in 1995, the land the Zapatistas occupy is still heavily patrolled by government forces.